Holroyd Miller have pleasure in offering for sale 5 Croxall Drive, Stanley a well presented three bedroomed semi detached house, occupying a popular and convenient position on the outskirts of Stanley village north of Wakefield city centre and offered with NO CHAIN. ENTRANCE HALL With double glazed entrance door, single panel radiator. LOUNGE 13' 7" x 12' 7" (4.16m x 3.84m) With useful under stairs storage cupboard, double glazed window, central heating radiator. DINING ROOM 10' 5" x 8' 0" (3.18m x 2.45m) Being open planned to the living room, with double glazed window, central heating radiator. KITCHEN 10' 5" x 7' 1" (3.19m x 2.18m) Fitted with a matching range of shaker style fronted wall and base units, contrasting worktop areas, stainless sink unit, single drainer, fitted oven and hob with extractor hood over, plumbing for automatic washing machine, double glazed window, central heating radiator. REAR ENTRANCE PORCH With double glazed window and rear entrance door. FIRST FLOOR LANDING With double glazed window and central heating radiator. COMBINED BATHROOM Furnished with modern white suite comprising; pedestal wash basin, low flush w/c, panelled bath with shower over and shower screen, tiling to the walls, double glazed window, chrome heated towel rail. BEDROOM TO REAR 9' 1" x 9' 2" (2.78m x 2.80m) plus recess With natural recess for wardrobe, double glazed window, central heating radiator. BEDROOM TO FRONT 13' 0" x 8' 5" (3.97m plus recess x 2.58m) Again, having natural recess for wardrobes, double glazed window, central heating radiator. 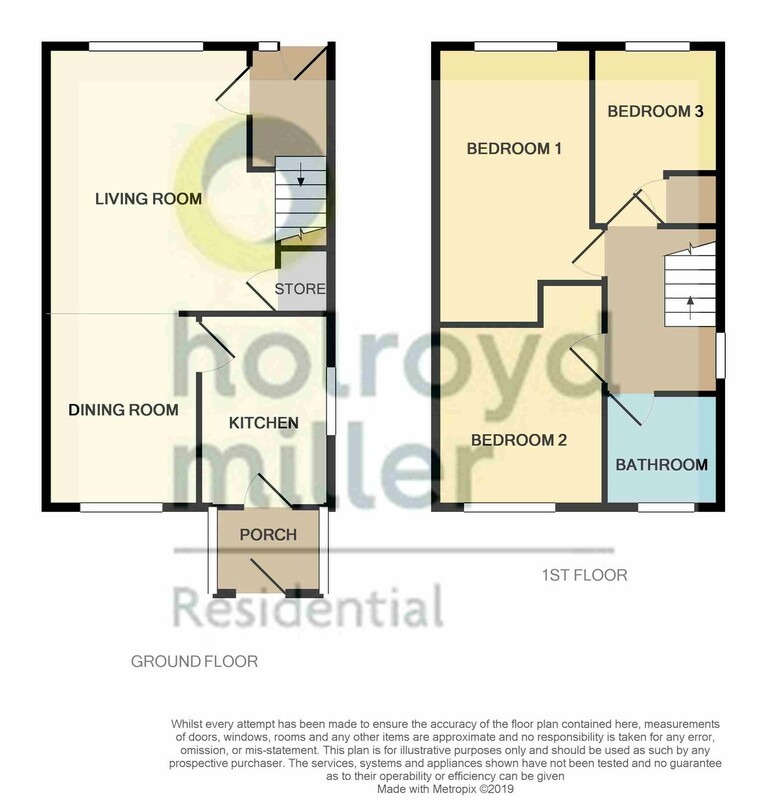 BEDROOM TO FRONT 6' 9" x 9' 6" (2.08m x 2.91m) maximum Having useful storage cupboard containing combination central heating boiler, double glazed window, central heating radiator. OUTSIDE Neat paved garden area to the front with steps leading to the front door, paved driveway to the side provides ample off street parking, to the rear, mainly laid to lawn garden with paved area.